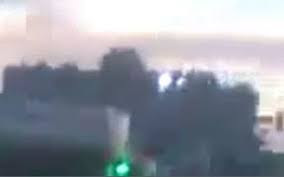 Update, March 31, 2013: Thanks to Petri, I finally noticed a comment left here recently by someone in Libya, phone number included, who claims he filmed one of the three videos examined here (not sure which one - See comments below, scroll waaaay down.) How do you respond to that? I ventured a guess, right below that. For those who've read this post before when it was boring, please check it out again. It took me two weeks, but I finally finished my analysis and it went better even than I thought. The introduction is optional context information. The actual analysis below that is what matters, with the videos themselves best for double-checking me. For those not inclined to read, I have a video explanation up now,embedded at the post's bottom. [M]embers of Al-Bayda Internal Security Agency fired live ammunition at a demonstration in Al-Salhi Square and the Commission has verified that several demonstrators had been killed. 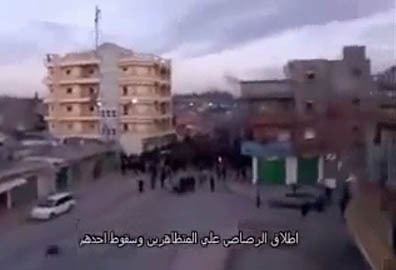 On 17 February, according to information received by the Commission from forensic and prosecutorial authorities, security forces of Khamis Katiba were deployed in Al-Bayda where they shot at demonstrators without prior warning, resulting in the deaths of 11 other demonstrators. Other witnesses spoke specifically of actions of the ISA and Revolutionary Committees in shooting at persons during demonstrations. This is similar to what they found, mostly from just accepting what "protesters" told them, in several other Libyan cities. The main difference is that with al Baida, there is also at least some video evidence to support people being killed while only protesting. Aside from the very few flukes like this, the Libyan government's explanation seems to fit the video record much better than the charges of the protesters and, pretty much, the world. Rather than peaceful protesters mowed down for speaking up, what the evidence (and lack of it) suggests is they were generally killed trying to storm army bases to secure their starter weapons for a military takeover. Few countries in the world would tolerate that without at least trying some deadly force to prevent it. (See the detailed article on this big question here). A while back a Youtube friend tipped me off to an interesting angle about some videos I was already aware of but hadn't posted on yet. I already aware of two of the three videos he linked me to, listed and shown below. These were both the only videos I recall seeing where apparently unarmed protester types are shot dead right on camera while not clearly attacking a government facility. I only noticed seeing them together they were from nowhere but al Baida. 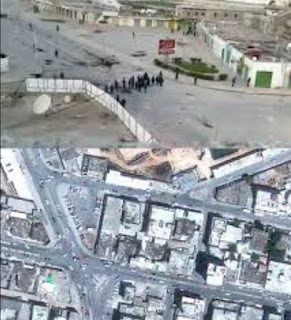 Looking closer yet (again, below), I see they're apparently from nowhere but the intersection of Sharia Omar al-Muktar and Souq al-Hoot in al Baida. I knew one of the videos below (the third) was from there, and didn't even know of the first one's existence. But they're all from that town of around 200,000 between Benghazi and al Qaeda central, Dernah. Al Baida's youth and Islamists were among the first to violently revolt; along with Benghazi and Az Zintan, al Baida witnessed violent protests and the torching of police stations on the 15th and daily from there. People were dying there, in small numbers and on both sides, from the very outset, unlike even in Benghazi. On the 18th, two policemen (internal security, I presume) were hanged by protesters there, perhaps angry about something that happened on the 17th. Al Baida also fell before Benghazi, at an uncertain time between Feb 18 the Feb 20. The rebels there or perhaps from Dernah - Libya's nearby al Qaeda central - were able to spread out and take nearby Shahet military base, early on the 19th, and Labraq airbase right after that (before the 21st). The weapons seized from Shahet apparently assisted the final taking of the "Katiba" barracks in Benghazi the following day, marking the effective conquest of their new capitol city. And by the time of the al Baida massacre, where 22 government soldiers were executed and blamed on the regime, there were some strange people working that town. One bearded, possibly be-robed man with a walking stick and questions about Emirs passed judgment, on video, upon the condemned men some evening around Feb 19-22. They deserved their fate, he said, for daring to shoot back at the rebels as they took Labraq airbase (see here for the transcript). On the days the videos below were filmed, who was working that town? Posted by Libyanm, Jun 10, but dated on-screen Feb 17, day 3 of fighting. 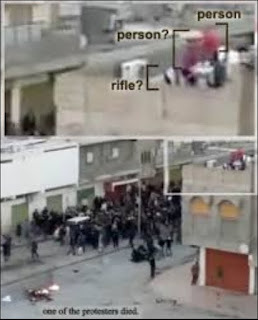 2) "Qaddafi's men open fire on a funeral procession and kill mourners, Al BaiDa'"
Posted by LibyanSolidarity, March 2. On-screen text has, in "Indian numbers," 17, suggesting again Feb 17. The day or the group? Dunno. 3) "VERY GRAPHIC_ BOY KILLED BY GADDAFI MEN IN BAYDA LIBYA"
Posted by apologiiiize, Feb 20. Description gives this as the date of the incident. Could be earlier. Only the date, February 20, and its view from ground level sets video 3 apart. Otherwise it seems all three videos seem to show either the same encounter or the same exact type of encounter happening repeatedly at the same spot. Video 3 is unique in showing it from ground level, as the crowd stops moving forward, holding a position near a row of dark blue blobs that seem to be internal security police. The quality is just atrocious. I've wondered if the resolution was lowered to obscure some detail. Like, for example, which way are the police's weapons pointing, up or forward? A shot is fired, then we see a man down, a young guy, unconscious it seems, a pool of blood under the back of his head. Other quickly pick him up by the hands and feet and run him back the direction they came, blood just pouring from his head all the way. Barring an elaborate special effects job by the protesters (not impossible), it seems there's little doubt this kid was shot in the head right there, ten feet in front of this camera person, and was dead soon after. We're to presume the shot was from the security men just fifty feet away at the intersection. But that's not what we're doing. Videos 1 and 2 I'll focus on more. They are filmed from different low rooftops or mid-level balconies near each other, I've decided. 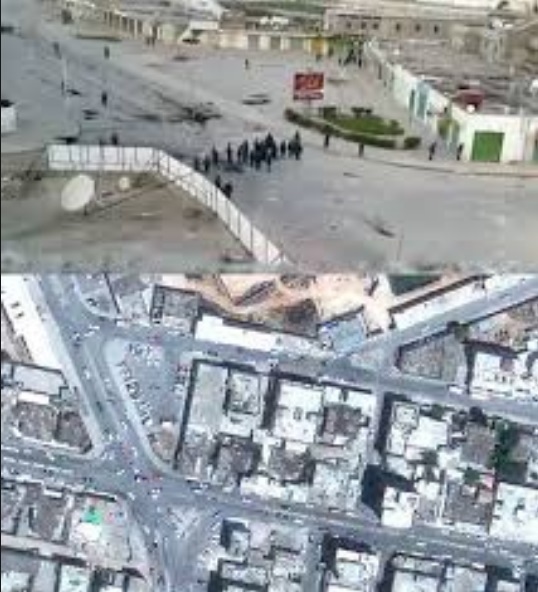 For starters, I have a probable location within al Baida for the incident(s) shown in these three videos. The image below gives the best view from video one for comparison. The intersection, the buildings west of it, and the parking lot in particular perfectly match, and all else is consistent at least, for blocks down the street. Im 90% sure this is the spot. The police line is quite near that presumed security center. The battle-scarred pavement around them seems to be from some previous violence. The white smears are I think from large rocks native to the area, breaking into chalky dust (al Baida means “the white,” by the way). The black smears are apparently from Molotov cocktails or some such, like the rocks, hurled towards the police line. In this video, both sides are hurling things at each other. The security men run around in their area, with more coming from the north, but don't advance or retreat. Some hold rifle-shaped weapons for firing something - bullets, tear gas, I'm not sure. The sound of shots combined with no one running suggests they are shooting mostly in the air and everyone here knows that. But video one's subtitles disagree, saying they're clearly firing bullets at the crowd. To be fair, at least twice security men are shown pointing their guns - of whatever type (I'm no expert) - in the direction of the approaching crowd (see right). Neither of these lines up with the actual shooting captured. The subtitles call the man at left, kneeling and apparently aiming his weapon, a "sniper." This a little bit ironic, as we'll see below. The first two videos show two separate shootings, at two different intersections. 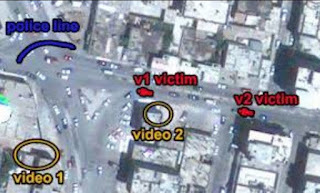 I'm pretty sure video 3 shows the same killing as video 1, from a position just a couple of people behind the victim. Video 1 has the shot come at 1:26. The victim is visible writhing around (or being adjusted?) on the pavement. There’s no ambulance; some of the protesters carry him off, back towards the hospital, within a matter of seconds. A pool and trail of blood are left, as happened with the victim in video 3. I think it's the same. Video 2, the poor quality one, has a shot fired at 0:09. It takes a moment to zoom in, to see a vertical blob is now horizontal, and a crowd has gathered around. A yellow ambulance comes in quickly to help, but a gray pickup truck pulled up to retrieve them just a moment before, blocking their path. The video cuts there, and we don’t see what happened next. In video 2, the ambulance comes in from the side of the police line. We’re to presume the shooting did too, but I'm not so sure. My theory, which is looking better the more I look, is that rooftop snipers along the route, provocateurs hoping to demonize the regime and enrage the masses below, are doing the shooting here. The camera just before the shooting. Just left of the sniper position? Video 2 has an unusual start, giving me my first clue. The camera starts out watching the procession, then cuts. Whatever happened in the interim, it isn't long, and cuts back to a view from behind a corrugated metal wall, a great sniper nest if there were a hole in it. The camera emerges from behind this wall to again watch the crowd below. In a possible coincidence, the shot is fired just then, as soon as the targets are being recorded again. I can totally envision the camera guy cutting to ask the sniper next to him "we're ready? They're getting close." Getting the yes, he rolls again, then gets in position, and with a signal that he's recording - bang. Gaddafi crime on video, ready for prime time worldwide. 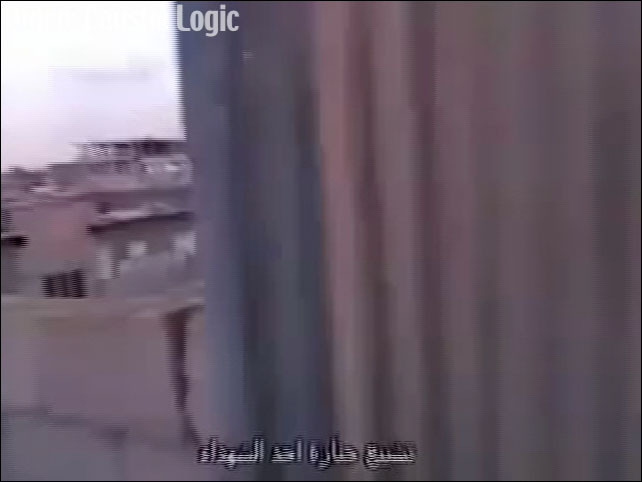 If the first team shot both the victim and the video from their rooftop, they’re apparently not shooting now. But a person was just shot beneath them once the other camera had a view. Was it really the police this time, or another sniper yet next to this camera person? Twice in a row, a demonstrator was shot down just as they came into a cemera's line of view. I'm not sure yet how to analyze the audio aspect of the videos, but unless it's been doctored, a shot from the police zone down the street should sound very different from a gun right there next to the camera. But just from the visuals, I think we have a compelling, if not conclusive, case that these rare protester deaths were part of a coordinated false flag operation by extremely sinister elements within the Libyan uprising. Note Sept. 11: One more odd bit - the gray truck in video 2, that has the victim loaded in its bed instead of in the government ambulance, was parked right there waiting. It pulls up just before the shooting in fact at 0:05, before the first cut (perhaps being the signal to double check everyone's readiness?). All it does is park there. Then comes the brief edit, the gunshot, enough time for the death and reaction to filmed for a moment passes. Then the truck rolls forward just in time to keep the evidence from the authorities, we presume. A group of people loads the victim, and in a matter of seconds, the truck drives through the crowd towards the hospital or wherever. I think what happened next is the crowd blocked the ambulance until it gave up, but again, that part wasn't shown. Why there was no truck ready the second time, I do not know. And one more thing, as I included in the video but not above, there is a possible clue from camera 3. Numerous gunshots happen with little effect on his filming. 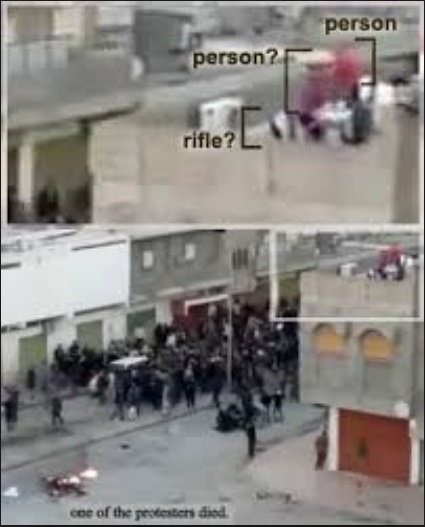 But for some reason, the one that killed the protester in front of him has the camera panning around differently, focusing briefly on only one spot - up, ahead, and to the left, in the direction of the building top where I think the shot came from and where video one was recorded. At left is the only view I know of of that building (the taller one with white lights at the top). Comments (see below) submitted by astute reader Felix alerts me to A report on the website of AlKarama 4 March 2011. AlKamarais a Switzerland-based organization, he says, and the report "mentions that the evidence for 59 deaths in Al Baida is based solely on death certificates issued by the hospital, all for bullet wounds (allegedly). These are assumed to be demonstrators." Indeed, that was their basis for proving a government order worthy of investigation and sanctions. As this study shows, that was a leap of faith (unrecognized?) that seems unwarranted. The report also mentions "a 10 year old girl, Rokaya Mabrouk, shot dead in Al Baida on 18 February 2011 and a 14 year old boy, Saad Al Yamani, killed in front of the security forces' headquarters on 16 February 2011," Felix says. Sounds like deft provocateur work, just like the videos examined above. Felix also reasons that these videos might be from the 16th instead of the 17th, citing exactly two protesters killed in front of the main security HQ that day - Mr.Yamani and a 21-year-old named Khaled Naji Khanfar. Other than one in Ajdabiya, and a few in front of al Abraq airpot, the rest of the death locales are given as just "Al Baida." Quite a few are listed as going down that day, any of them perhaps at the same place, just not specified. I could go with either day at this point, and I don't suppose it much matters. But the location is a match. One site I found gives "Al Jabal al Akhdar" as one of Libya's 25 municipal adminstrative divisions. Many cities have a district of their own name, but not al Baida. So the civil defense station of that name these protesters were shot near would seem to be the main one for that city, as cited for those two shot guys.